This is story about kid growing up as normal kid, but when he grew up, then a lot went wrong in twenty years of his life. Something happen, he had a dream, dreamed of all these miracles. Then when he woke up he start to believe all things possible, the supernatural came down on him as a star from sky fell on him as turn to drops of water then it fell on his head. 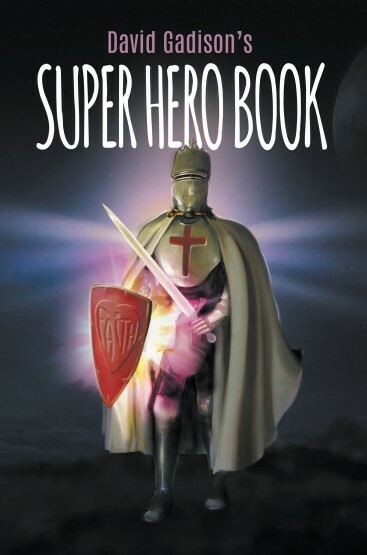 Then he transform to Super Hero then he went fix everything that went wrong in twenty years of his life. And he went heal aunt of cancer, deliver his brother. And one lady lost her baby during birth and Mighty Man went save baby. Also it were big tragedy going in the world and only got ten hours to stop nuclear bomb from destroying world. And Mighty Man went save the world Then he also he had these adversary try to go against him after bomb threat. Then it rain big stars from sky then the Mighty conqueror came to help Mighty Man then finally the earth were back to normal then Mighty conqueror went back home as whirlwind then Mighty Man got to go back home then the kids start crying then Mighty Man comfort their heart and then Mighty Man left as blaze of light, back to sky, then the kids start saying while Mighty Man. 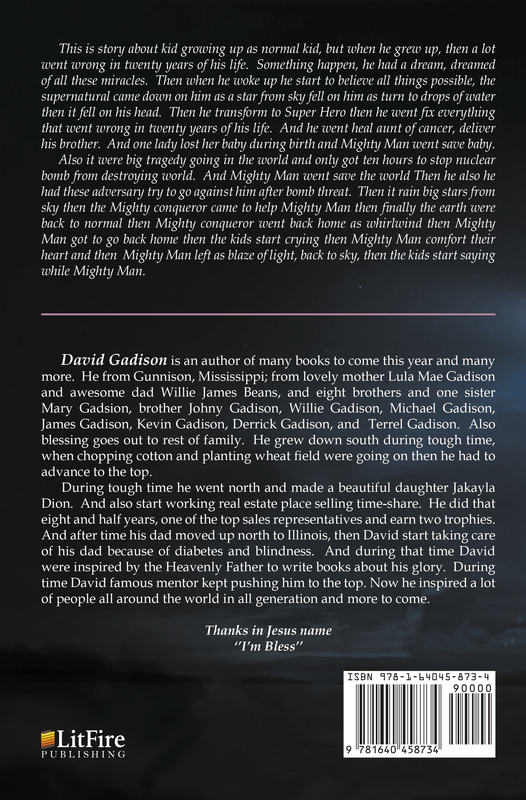 David Gadison is an author of many books to come this year and many more. He from Gunnison, Mississippi; from lovely mother Lula Mae Gadison and awesome dad Willie James Beans, and eight brothers and one sister Mary Gadsion, brother Johny Gadison, Willie Gadison, Michael Gadison, James Gadison, Kevin Gadison, Derrick Gadison, and Terrel Gadison. Also blessing goes out to rest of family. He grew down south during tough time, when chopping cotton and planting wheat field were going on then he had to advance to the top. During tough time he went north and made a beautiful daughter Jakayla Dion. And also start working real estate place selling time-share. He did that eight and half years, one of the top sales representatives and earn two trophies. And after time his dad moved up north to Illinois, then David start taking care of his dad because of diabetes and blindness. And during that time David were inspired by the Heavenly Father to write books about his glory. During time David famous mentor kept pushing him to the top. Now he inspired a lot of people all around the world in all generation and more to come.